I've been alluding to several big announcements coming up that I've been working on through the Fall. The first clue was "Itâ€™s compact, re(a)d, and has a tail." 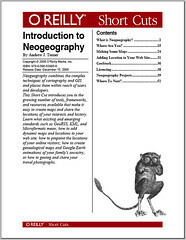 I'm very excited to announce that I've written a book with O'Reilly Media, Introduction to Neogeography. It's a Shortcut, so it's concise, focused, and available digitally right away (none of that annoying shipping or killing trees for printing - think of the environment!) It's filled with examples, references, and links to projects and ideas to get you started mapping your own places. Neogeography combines the complex techniques of cartography and GIS and places them within reach of users and developers. This Short Cut introduces you to the growing number of tools, frameworks, and resources available that make it easy to create maps and share the locations of your interests and history. Learn what existing and emerging standards such as GeoRSS, KML, and Microformats mean; how to add dynamic maps and locations to your web site; how to pinpoint the locations of your online visitors; how to create genealogical maps and Google Earth animations of your family's ancestry; or how to geotag and share your travel photographs. My goal was to provide a solid introduction and survey of the new standards and technologies that users and developers are creating to share their location and travels. Its currently a very fast-paced field and by solidifying and explaining some of the core concepts I hope to provide a solid basis for new neogeographers to begin mapping. Mikel and Guilhem have both already given reviews. Much appreciated. Here is the full TOC - due to formatting O'Reilly only provides a shortened listing in the actual book. It's priced $7.99, so quite a great deal for the amount of information inside (but then again, I'm biased). After you finish it, I highly suggest hopping off to one of the mailing lists, forums, IRC, projects, or a follow-up in-depth book. The book was inspired by watching Schuyler Earle not once, but twice in a week in a half hop around on stage shouting about neogeography, how cool maps are and 'red dot fever', and to Platial for popularizing the term 'neogeography'. For readers and those interested, I'll be putting up demos and more announcements on the book's site: MapSomething. Please let me know what you think of the book - or just Neogeography in general (it's ok if you haven't bought the book, I'll still like you).